You. Me. 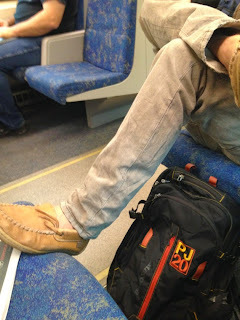 Ride This Crazy Train - Adventures and Observations on The GO: Isn't it nice when a person puts his foot up like this, you move and they still don't get the hint?! Isn't it nice when a person puts his foot up like this, you move and they still don't get the hint?! This was texted to me. 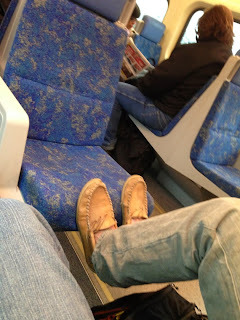 The person was sitting beside this foot rider at first until the foot rider swung his leg up. Really, how rude? Like anyone would want the bottom of a shoe across the chest? So the person moved to sit opposite of this clown and the foot rider still didn't get it. That's the thing about western society. Some people get to "own everything". That's what's known as "personal liberty" or "personal rights".